One of our favorite spring ingredients, fresh green almonds, are just that – green (as in “unripe”) almonds, picked while the nut is immature and still in the early stages of formation. Green almonds are available only in the spring, usually beginning in late March or early April, and can continue to be harvested into May. 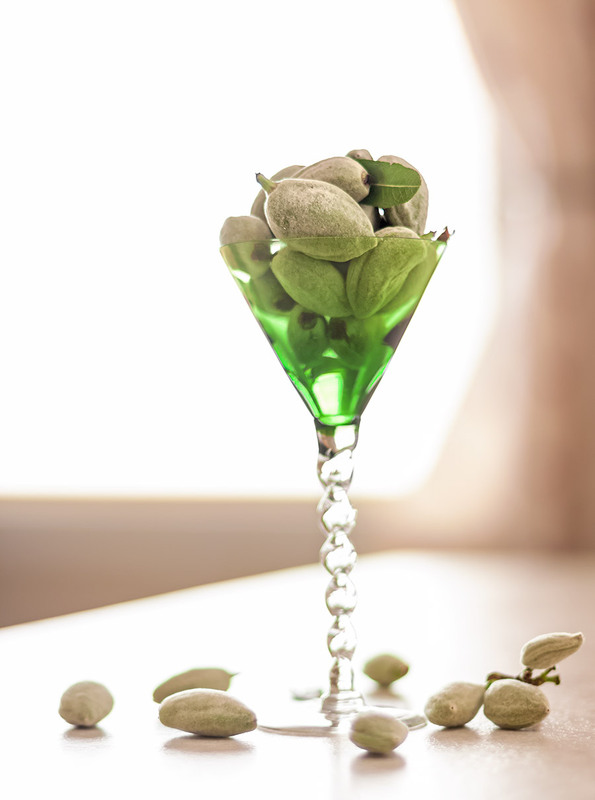 In the earliest stages of growth, the entire almond is eaten, fuzzy green outer hull and all. The flavor is surprising; tart, almost citrusy, somewhat reminiscent of unripe green apples. Later, the kernel will turn opaque and white, but at this stage, the forming nut is clear and gelatinous, with a soft, jelly-like texture. The fuzzy outer part is firm and crisp, with a satisfying crunchiness that makes a pleasing contrast to the soft soba noodles in this salad. 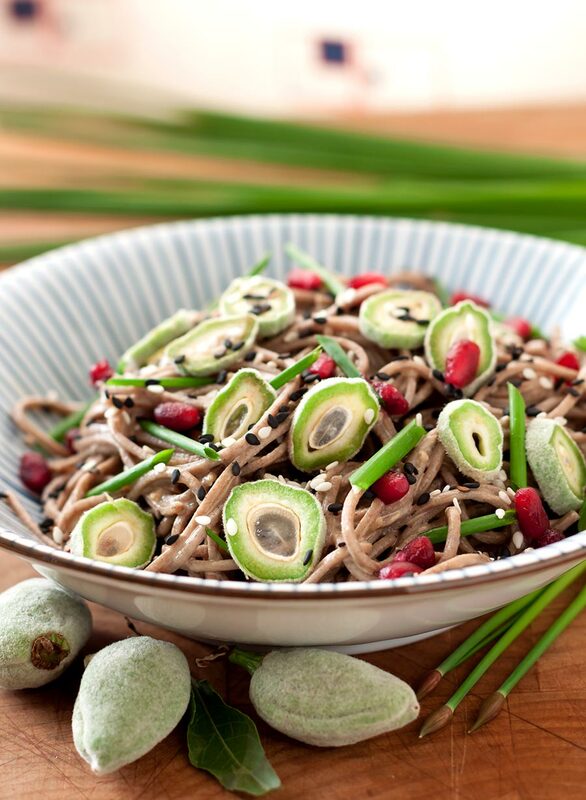 Inspired equally by both Asian and Mediterranean cuisines, the salad starts off with a base of soba (Japanese for buckwheat) noodles, tossed with a sesame-soy dressing. We’ve used tahini, a Mediterranean-style sesame paste with a slightly lighter color and milder flavor than its Asian counterpart, to avoid masking the delicate flavor of the green almonds. There’s very little actual cooking involved in making this stunningly simple dish. If you can boil water, you’re already halfway there. Start to finish, this refreshing noodle salad should take less than 20 minutes to prepare, leaving plenty of time to get out and enjoy a sunny spring afternoon. Bring a pot of water to boil. Add the soba noodles and cook for 4 – 5 minutes. Watch that the pot does not boil over (soba noodles will do that!). Drain the noodles in a colander with small holes. Rinse with cold running water, drain again and set aside. Slice the chives (or green onions) into short, matchstick-like pieces. Rinse the green almonds well under cold running water. Drain, pat dry and slice thinly. Toss the soba noodles with 4 tablespoons of the sesame dressing, or to taste. Divide the dressed noodles between 2 or more bowls. 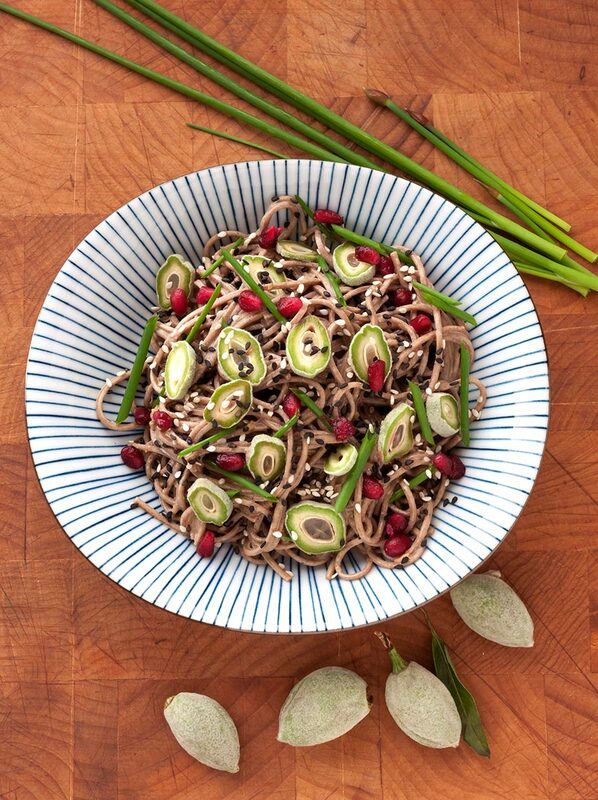 Top with the sliced green almonds, chives and pomegranate arils. Sprinkle with the black and white sesame seeds and serve. This recipe makes more than enough dressing for several salads, which is a plus, since it’s so tasty that you’ll want to use it on everything. Heat the oil in a small saucepan. When hot, but not smoking, add the ginger and garlic. Cook, stirring occasionally, until soft and fragrant, about 2 minutes. Add to a bowl with all of the other ingredients and mix well with a whisk or an immersible stick blender. Blend until smooth and creamy. Cover and refrigerate until ready to use.